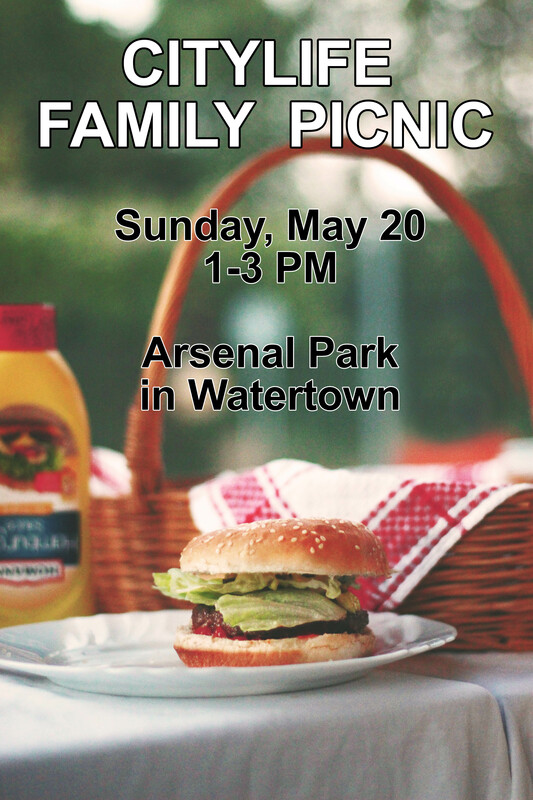 You are invited to join us at the Citylife Family Picnic on Sunday, May 20th at Arsenal Park (485 Arsenal St, Watertown, MA 02472), where we will enjoy the beautiful spring weather and take an opportunity to feast together. Communal feasting is a life-giving habit of grace, a joyful opportunity to celebrate the fact that we have been formed into a true family in Christ. The church will provide all the supplies for hamburgers and hot dogs, as well as drinks. All sides and desserts will be pot luck. The picnic will begin at 1:00 pm and end at 3:00 pm. You are encouraged to bring your children, friends and neighbors. You are also encouraged to bring chairs or blankets to sit on, as well as any games or toys for your children to play with. There is a very nice playground at Arsenal park, and we will have a time of organized games for the children, as well. Please take a moment now to RSVP and sign up to bring a side or a dessert so that everyone will have plenty to feast upon. It will be important for us to know how many will be attending so we can make sure to have plenty of supplies. If you are able, please volunteer to serve on the grill or to help clean up after the picnic. There are columns for these duties on the RSVP sheet, linked above. If you have any questions about the picnic, please email Isaac Bruning at isaac@citylifeboston.org. We eagerly look forward to this delightful day together in the sunshine!